Every so often, on Official Playwrights of Facebook, a debate erupts about the merits of the ten-minute play. Naysayers contend that there’s no such thing as a ten-minute “play”; it’s an exercise, it’s not real writing, it’s a sketch, and so on. Proponents counter that a good (and they do acknowledge that, as with full-length plays, there are many bad) ten-minute play is indeed a play with a beginning, middle, and end, and its concision requires the skill of an accomplished writer. It doesn’t matter where you fall in this debate. If you’re a trying-to-make-it playwright—meaning anyone who plays the submission game, doesn’t have an agent, doesn’t get regular requests for their work, isn’t published, isn’t published enough, still needs to network, wants more productions—which I’d say is most of us, there are quantifiable, practical reasons for writing ten-minute plays. Even if you hate them. 1) They’re easier to get produced than full-length plays. I don’t know if I’d still be a playwright today if I hadn’t started writing ten-minute plays. In 2010, I had my first-ever production; it was a full-length play called THE COUPLE NEXT DOOR, and it did very well, becoming the highest grossing world premiere in Road Less Traveled Productions’ history, and the sixth highest grossing play overall. Awesome, right? Except you all know that one success doesn’t mean anything. Especially in a small city. Especially by an unknown. I sent THE COUPLE NEXT DOOR to more than 300 theaters in the ensuing six months, and got a few nibbles, and nothing more. The play has had two—with a fourth upcoming—more productions since, but it took six years for that to happen. That’s the nature of full-length plays. It takes a lot of stamina and patience and, in the meantime, your name isn’t out in the theater universe. On the flip side, in the wake of THE COUPLE NEXT DOOR, I started writing and submitting ten-minute plays. Within months, I had my first production with “Write This Way” at Theatre Out in Santa Ana, California; the play even won the Producer’s Award. Several others followed quickly. Success! Validation! Inspiration! Confidence! For a new playwright, this was paramount in making me believe that I had abilities (and my goodness, if you don’t need those things to stay motivated, then I want some of your drink). Better? You can get lots of ten-minute play productions in a year—and many pay royalties that not only add up, but also continually create those feelings of confidence, validation, and success. Those ten-minute play hits are the bright spots that keep you going as you wait for responses on those full-lengths. 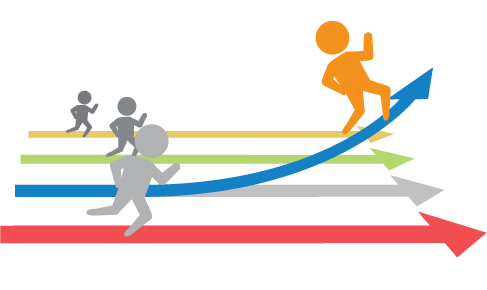 3) There is less competition. With most ten-minute playfests, you’re submitting to a call, which means you’re not competing with every ten-minute play in the universe, just those from playwrights who answered the call (which has the added bonus of meaning plays will actually be read, and some produced). But, perhaps more importantly, you’re not competing with well-known or famous playwrights, who don’t tend to write ten-minute plays unless they’re asked to, and certainly aren’t submitting them to your average ten-minute play call. That means better odds for you. 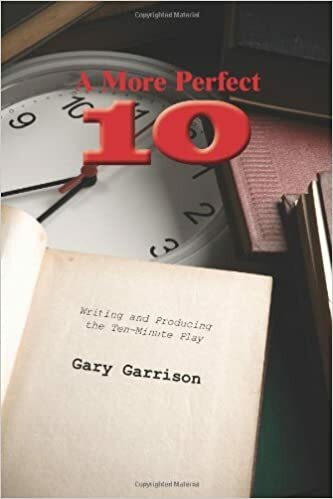 If you need help getting started–or getting better–you can’t go wrong starting with Gary Garrison’s A More Perfect Ten: Writing and Producing the Ten-Minute Play. 5) Writing good ten-minute plays will help you write better full-length plays. A great ten-minute play is a tight, economic scene, and learning to write one well yields skills that transfer well to full-length plays. I know many playwrights who became better playwrights through the writing of ten-minute plays, and, indeed, their first productions (and first royalties!) were from ten-minute plays. That doesn’t make ten-minute plays exercises, just pragmatic stepping stones. 6) Ten-minute plays free you to experiment. With so little comparative time invested in writing at ten-minute play versus a full-length, trying something new doesn’t mean a lengthy commitment to something that might not pan out. You want to try absurdism, magical realism, a solo show, anthropomorphism—do it! I don’t consider myself a comedy writer, but I’ve surprised myself by writing quite a few ten-minute comedies that have done very well! 7) Ten-minute plays can pave the way for more diverse full-length plays. When you allow yourself to stray from what you’re comfortable with, creative potential is unleashed. Two of those comedies I mentioned above? They’re now full-length plays, one of which—CHRISTMAS 2.0—was workshopped at the Hormel Festival of New Works, and the other—OPEN AND SHUT—was a commission of sorts. Because the comedic tone was already set in the ten-minute, I was able to follow that as I wrote the rest of the show; I’m positive I wouldn’t have set out to write a full-length comedy otherwise. Ten-minute plays allow you to play with an idea, and therefore expand your writing horizons. In other cases, there are characters from the ten-minute play that you just know have more to say; that might mean the ten-minute play served as an exercise, but it doesn’t mean it’s not good all on its own. 9) Ten-minute plays are a tremendous means of networking. The more productions you have—of any kind—the more your name stays current. Every time you get a production of a ten-minute play, you meet a theater, a director, and actors—something that is very difficult to do if you are not a regularly produced playwright, or not in a primary theater city. A production of a ten-minute play is better than that elusive coffee with an artistic director because the AD who produced you has already read/seen your work. Because of a ten-minute play production, my submissions to a full-length call yielded a personal exchange with the AD—just because he loved the ten-minute play they’d produced. The aforementioned OPEN AND SHUT? That was a commission from an AD who liked the ten-minute play produced at his theater, and asked for it to be expanded; we recently had a very successful reading and it has a good chance of future production. My third production of SAFE? Yep. The director who directed my short, “Jack Pork,” in another festival is the AD at Queer Theatre Kalamazoo. I asked if she takes full-lengths, she read SAFE, and bam! I did the same thing following a call for plays from Open Eye theater, and that led to my first production of FLOWERS IN THE DESERT. This aspect of writing ten-minute plays cannot be overstated: in a business where we are always clamoring to get through a door, ten-minute plays provide seamless entry. This Fancy Pants production of the short play, “Jack Pork,” led to a relationship that led to a third production of SAFE, and more. 10) Like them or not, ten-minute plays are not going away. For all the complaints about how they’re destroying playwriting, ten-minute play festivals are propagating rapidly as more and more theaters realize the value of these productions—easy sets, large casts, the ability to serve many playwrights. Probably two-fifths of my play submissions per year are for ten-minute plays, which garner me about forty productions annually. That means I nearly always have a production happening and I won’t lie—that makes me feel like I’m doing something right, and that’s a feeling that artists need to have, kind of constantly if we’re honest. I know we’d all prefer to have our full-lengths produced on a regular basis, but, in so many ways, ten-minute plays help make that happen. Arguing against them is only denying yourself opportunity. To read entries in Playwrights Living Outside New York series, click here or #PLONY in the category listing at upper right. Thanks for the great article about 10 minute plays. As you know from our work together on your show, “Doughnut Hole,” one of the most popular formats for Senior Theatre is the 10 minute play. Older actors love the format because it’s easy to rehearse and several can be strung together to create a complete program. We now have over 400 plays, books, and materials in the Senior Theatre Resource Center collection and most are short plays. If playwrights would like to know more, they should feel free to visit the website, email, or call 800-858-4998. We’re always interested in talking to playwrights about our Senior Theatre needs. Thanks for this! Interesting and relatable reading! The Playwrights Association of New Zealand has just put out a book of 10 min plays called Stage Journeys and I have 2 plays included. What is the best way to market these to the masses? Thank you for the inspiring article about the 10 minute play. I am writing solo theater and working with a marvelous character. I see the life of the character to have a sequel each year. With your keen suggestions, I will use some of these techniques to create a series of 10 minute plays! I now can add that second or third character in my 10 minute play that I have written out of my solo theater work! The ten minute play adds new blood to my interest in alternate media theater. Ten minutes is very economical with time, space and budget. This concept of the ten-minute play creates the best of both worlds for the playwright. Stay in touch! Thank you for the inspiring article about the 10 minute play. I am writing solo theater and working with a marvelous character. I see the life of the character to have a sequel each year. With your keen suggestions, I will use some of these techniques to create a series of 10 minute plays! I now can add that second or third character in my 10 minute play that I have written out of my solo theater work! The ten minute play adds new blood to my interest in alternate media theater. Ten minutes is very economical with time, space and budget. Stay in touch! I always appreciate your insight and thoughts. I enjoy reading the things you have to say and have participated on a few occasions with #TAPT. However, I wonder if #3 might not be so true any more. Frequently, when I get my rejection letter from a contest or festival I’m informed that 300 or 600 plays were received. That’s a lot of competition. It feels like more than there was ten years ago. Which has me wondering if maybe there are a lot more people out there taking your advice – and the advice of quite a few other proponents of ten-minute plays – and are writing them and submitting them. Not that I’ll stop writing them. I find them great for exploring ideas that might later feed into a longer play. Earl— But still far, far fewer than the competition for any single full-length slot in a theater’s season. wonderful information. I really enjoyed reading your blog post. I co-produce a popular lunchtime playreading series called Play With Your Food. We’ve been staged readings of one acts for over ten years. My problem – which it would be interesting for playwrights to know – is that I spend huge amount if time searching for those amazing 15 to 25 minute killer good One Acts- like works by Frank Gilroy Matthew Lopez, David Auburn, (for example..). Those are the plays I’m looking for.. I wish there were more of those..
Have you ever considered putting out a specific call for plays of that length? Or joining NPX? It seems either of those might be an effective way to find what you’re looking for.